This easy-to-carry edition of the renowned Old Scofield Study Bible offers a wealth of study materials at a fantastic price. Featuring a traditional type setting cherished by many long-time Scofield readers, the Classic Edition, whose notes date from 1917, is the best cross-reference study Bible ever published. Among its many features are book introductions and outlines, unique subject chain reference system, comprehensive indexes, chronologies, a concordance and authoritative, full colour Oxford Bible Maps. KJV Old Scofield Study Bible Classic Edition Leather Black by Scofield C I was published by Oxford University Press in April 1999 and is our 35204th best seller. 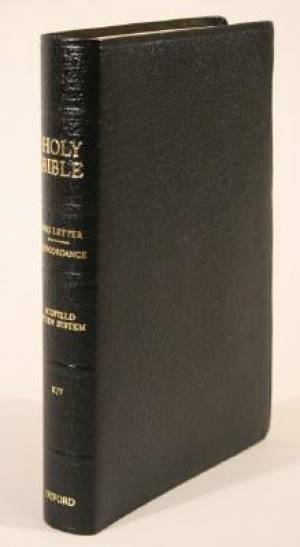 The ISBN for KJV Old Scofield Study Bible Classic Edition Leather Black is 9780195274639. Be the first to review KJV Old Scofield Study Bible Classic Edition Leather Black! Got a question? No problem! Just click here to ask us about KJV Old Scofield Study Bible Classic Edition Leather Black.